The PolNet ACP-9 allows you to share up to nine devices per line. Just think of the savings! No wonder businesses from Fortune 1000 to small proprietors rely on PolNet for polling and other data exchange applications. 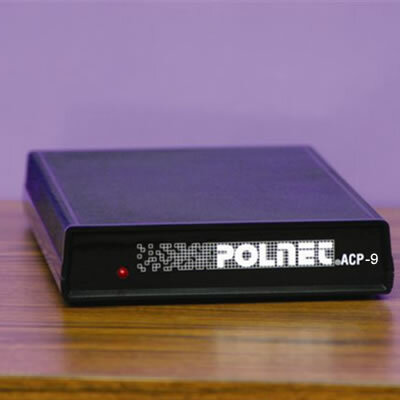 PolNet ACP-9 offers more than cost-effective connectivity! With added information security and equipment protection, PolNet gives you piece of mind. Engineered with programmable security access codes for each device port, PolNet ACP-9 gives you Total Hacker Protection to keep your proprietary information safe. PolNet ACP-9 also provides dual surge protection for added defense against transient voltage carried over the phone line. Remote Diagnostics and Programming lets your central MIS Operations reprogram and troubleshoot the remote location ACP-9 in a single phone call. The ACP-9 is reliable and compatible! Manufactured to strict standards, PolNet is compatible with virtually all analog phones lines, communications equipment and phone systems. Fax Tone Detect is a feature that enables the ACP-9 to detect CNG (CalliNG) tones from incoming auto-fax call and route it to a predetermined device port. The ACP can also be programmed to seize the phone line after a data transmission has finished through one port and monitor the call for additional security access codes, which route the call to the next port. Use the PolNet ACP-9 for modems, data and credit card terminals, storage and monitor-throughput, if your equipment requires a phone line, the PolNet works for you. The ACP-9 is a Commercial Grade Business Solution that lets you stop paying multiple phone line charges for your data equipment! The Polnet® ACP-9 is made in the USA. Questions about the Polnet ACP-9?